Many investors are interested in generating income from their investment portfolios. One way to make this happen is to buy dividend stocks and collect dividends. Here's how to find dividend stocks. A reliable way to find stocks that pay dividends is to use stock screening tools. You'll find these in the dashboard of brokerage firms like E*Trade, Fidelity, Schwab, and TD Ameritrade. The criteria relating to dividends vary among screening tools. 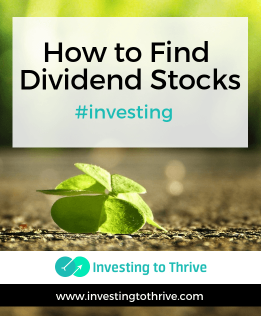 The main criteria to identify dividend stocks is the “regular dividend amount.” You can add more criteria relating to dividends or other areas, such as company size or financial performance. So if you're looking for stocks that have increasing dividends (year over year) and ones with a certain dividend growth rate, choose the “increasing or decreasing dividends” and one of the “dividend growth rate” criteria, such as 3, 5, or 10 year. Click on “View Matches” to see the results. In this example, matches included Dollar General, Equifax, FedEx, and Marriott International. 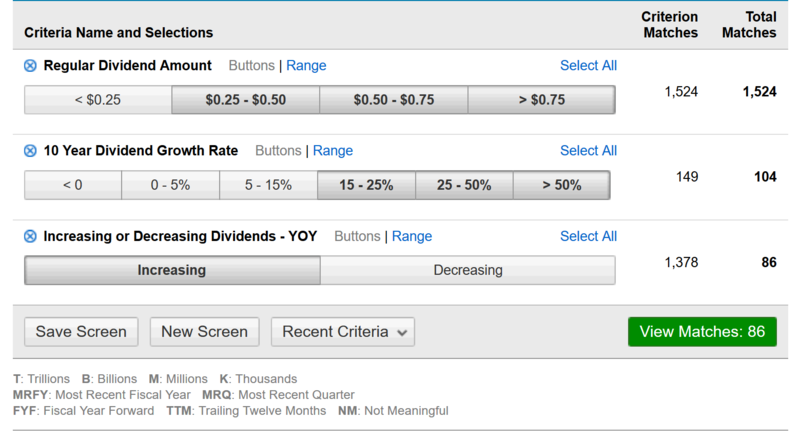 Note that these choices are available only if you sign into the Schwab dashboard, which requires creating an account. This setup is similar among the firms and screening tools I tested. Using this method, you'll find over 30,000 stocks that pay dividends. The list can be sorted by market capitalization, share price, and more. The list can also be fine-tuned by adding filters. This screen yielded over 140 results on the day I applied the screen and 600 on another day. Dividend stocks included well-known companies like Intel, Southwest Airlines, and Hormel Foods. Some ETFs specialize in certain types of dividend stocks. To find these, look for the word “dividend” in the name of the fund. It's as easy as it sounds. You can buy dividend ETFs if you want to invest in a group of dividend stocks. You can also use their prospectuses to identify individual dividend stocks. First, let's find dividend ETFs. Again, perusing a list of funds is an easy way to find these investments. The best places to find ETFs are brokerage firms and ETF providers, such as iShares and WisdomTree. Similarly, you can find individual dividend stocks by looking at the holdings of mutual funds specializing in dividends. If you know where to look, you can quickly and easily find dividend stocks. Brokerage stock screeners are my top choice for finding dividend stocks and I especially like the one offered by Schwab for this purpose. Are you looking for dividend stocks? Do you already own dividend stocks? What criteria do you consider when finding and choosing dividend stocks for your portfolio? So many good screeners out there. My favorite is safety net pro,. It is easy to use and has proven to be effective and accurate.